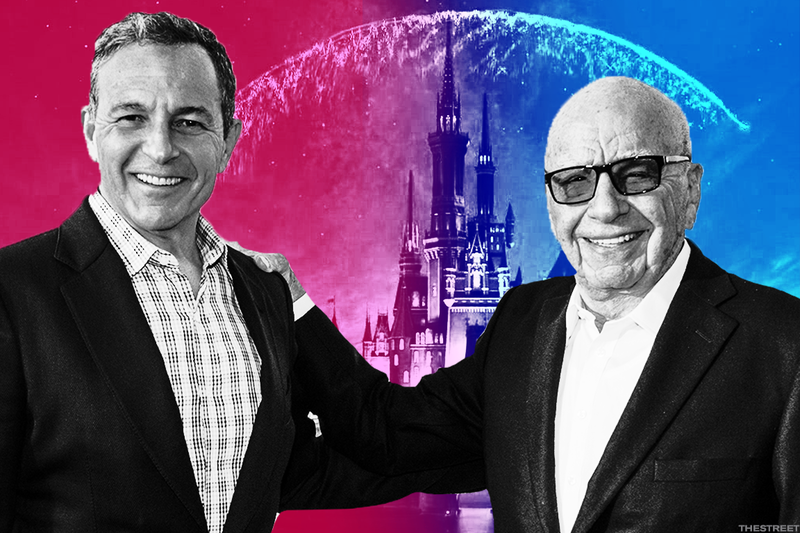 21st Century Fox said Disney's improved $38 a share offer for its media assets is "superior" to Comcast's and has postponed a shareholder meeting to discuss Brian Roberts' $65 billion approach. Twenty-First Century Fox Inc. (FOX shares opened at a record high Wednesday after Walt Disney Co. (DIS - Get Report) increased its bid for its media assets to $71.3 billion, just hours before the board of the Rupert Murdoch-controlled group was set to meet to discuss a rival offer from Comcast Corp. (CMCSA - Get Report) . Disney said it will pay $38 a share for certain media assets of Fox, the company said, a figure that is around $10 higher than the group's first approach that was made in December of last year. The new bid is constructed as a 50/50 "cash and shares" proposal, Disney said, and it has secured financing for the cash portion. Fox said the new bid would mean it will cancel its planned shareholder meeting regarding the $65 billion bid -- or $35 a share -- from Comcast and could not, at this time, consider it a "superior proposal." "The acquisition of 21st Century Fox will bring significant financial value to the shareholders of both companies, and after six months of integration planning we're even more enthusiastic and confident in the strategic fit of the assets and the talent at Fox," said Disney CEO Bob Iger. "At a time of dynamic change in the entertainment industry, the combination of Disney's and Fox's unparalleled collection of businesses and franchises will allow us to create more appealing high-quality content, expand our direct-to-consumer offerings and international presence, and deliver more personalized and compelling entertainment experiences to meet growing consumer demand around the world." Fox shares surged 6.2% to change hands at an all-time high of $47.48 in the opening minutes of trading on Wall Street while Disney shares were marked 1% higher at $107.23 each. Comcast bumped 0.44% higher to to $32.96. The battle for Fox is on. Disney said it thinks the deal has a "clear and timely path to regulatory approval." "Both companies have spent the past six months working toward meeting all conditions necessary for closing," Disney said. "In the amended agreement, Disney has increased the scope of its commitment to take actions required to secure regulatory approval." Comcast CEO Brian Roberts has said he was "highly confident" regulators would approve his company's approach following the go-ahead given to the $85 billion AT&T Inc. (T - Get Report) and Time Warner Inc. (TWX deal last week. Comcast also appeared to take the inside track in its £22 billion bid for Sky Plc (SKYAY when Britain's Culture Secretary Matt Hancock said he was "minded" not to intervene in a Comcast approach. 60 Seconds: What is the Volcker Rule and How Does it Affect Your Portfolio? "Having reviewed the relevant evidence available, I can confirm that I have today written to the parties to inform them that I am minded not to issue an [intervention notice] on the basis that the proposed merger does not raise concerns in relation to public interest considerations which would meet the threshold for intervention," Hancock said in a statement to lawmakers. Comcast has also formally notified the European Commission of its plans to bid for Sky, Britain's biggest pay-TV company, in a deal that could be worth $30 billion if it clears regulatory approval in both Brussels and London. The Comcast bid for Fox's assets, including the 61% of Sky that is currently on the table, could be worth a collective $60 billion, based on a Reuters report that suggested the Philadelphia, Pa.-based media group is looking at a bridge financing agreement of a similar size. The complex deal is hinged upon Fox's December agreement to sell most of its assets -- including flim studios, FX Networks, Fox Sports Regional Networks; Fox's international networks; Indian satellite TV group Star India; and stakes in National Geographic Partners, Hulu LLC and Sky -- to Disney for around $52.4 billion.